The heart and seat of power in China, Beijing possesses enormous influence, especially over nearby provinces. Its political influence has many a foreigner clamouring to come to Beijing, whether it be ambitious journalists or zealous diplomats. Beijing has a more Chinese feel than either Hong Kong or Shanghai. While first-time visitors are still awestruck by Beijing's massive roads and mammoth flyovers and vast skyscrapers, the city still maintains a charmingly antiquated atmosphere. Beijing's layout is simple. Its vast area is nicely and neatly designed embellished with massive structures such as Tiananmen Square and the Forbidden City. In some pockets of Beijing there are the historic neighbourhood hutongs mazes of tiny courtyard residences and alleyways, dating back hundreds of years. They are believed to have originated in the Yuan Dynasty, when emperors planned the city and arranged the living areas by social classes. By the early 15th century, aristocrats and high-ranking citizens made their homes in neighbourhoods nearer to the centre of Beijing, the Forbidden City. Further away from the palace lived the commoners; the artisans, labourers and merchants. Their hutongs were much smaller and simpler in design and build. Over the centuries, the number of hutongs in the cities grew. Now, though, many of these have been replaced by wide roads and gargantuan towers. Beijing is home to many of China's most awesome sites. Northwest of the city lie the mountains of Taihang and Yanshan, while the vast plains the region is known for roll out southwest of the city. 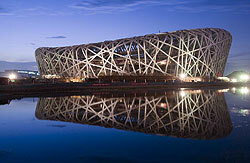 Beijing has maintained the epic grandeur that has run in its city blood from its Imperial days. The Forbidden City is a prime example of this. The largest palace in the world, the Forbidden City, was the home of 24 emperors from several dynasties. The palace boasts intricate roofs, majestic gates and impressive courtyards over thousands of square metres. China's greatest and most famous landmark passes through Beijing. Built as a military defence from outside invaders, the 4,000-mile long Great Wall is also famous for the epic stories that come from its long and difficult construction on different terrains. Other remarkable areas in Beijing include the royal family's vacation home (the Summer Palace), the emperors place of worship (the breathtaking Temple of Heaven), and the largest public square in the world, Tiananmen Square made iconic by the 1989 protests and the unknown man who held up a group of tanks by standing calmly in the middle of the road. Beijing is a bustling metropolis. Millions of cars and bicycles jam the massive roads and the side streets are crowded with pedestrians hurrying about their day. Magnificent skyscrapers block the smoggy and dusty skies, and shopping malls, restaurants, clubs, pubs and other commercial establishments are everywhere. Beijing also boasts of a rich performance culture traditional orchestral performances, acrobat and martial arts shows, and Chinese operas. Beijing has four very distinct, very extreme seasons. Spring is pleasant and bright, while summers bring out dusty winds and the scorching sun. While glowing autumn is lovely and crisp, winter is freakishly cold and long. Recently the host of the 2008 Olympics, the city continues to mutate into a modern metropolis at breakneck speed. Despite its massive growth, the wonder of Beijing still comes from its strange quality of calm, an atmosphere unusual to dynamic cities. Beijing would not be Beijing without mothers doting over dawdling babies and older men playing mahjong, all seemingly oblivious to the progress happening around them. Beijing is comprised of eight districts and two counties.